Transport of bike and rider – welcome to Canada! Soooo, I had no time to write during the last days…or I was just too lazy :-). I’m in Montreal, Canada now and things are on track. But what happened during the last days? As the requirements for the transport of the bike say that the bike has to be clean for the shipment and I know that Canadian customs authorities are very picky when it comes to bugs or dirt on the bike, I decided not to ride myself to Paris, but to rent a truck and to deliver the bike with it. So I did. I borrow some wooden planks from a friend and manage to push the bike myself in the enormous Mercedes Sprinter. I went to a village north of the Paris airport where I had booked a little room. The area was gastronomic wasteland and so I had to deal with an ‘Italian’ restaurant that set new limits….on the lower end. The next morning, I went to the cargo area of CDG and I presented myself at the shipper office. To my surprise, everything was finished after 30 min, they even went to customs for me. I only had to drive to the warehouse and to drop off the bike. This could have been also very quick, but the inspector had some problem with the weight that the company had put on the dangerous goods form and the paper had to be printed again in the office which took some time. but in the end the whole process was very quick and professional. I could start my return trip, putting the pedal to the metal. Quite a good truck, this Sprinter. When I had left the day before, Heinz had called and had asked me one question:”very nice, the cut fairing. But where are the vertical forced now going to?” And suddenly I realised that by cutting the fairing, I lost also the lower holders that gave a lot of support to the whole construction. And this was gone now. This meant that most of the weight is carried by the small bars in the cockpit – bound to break. 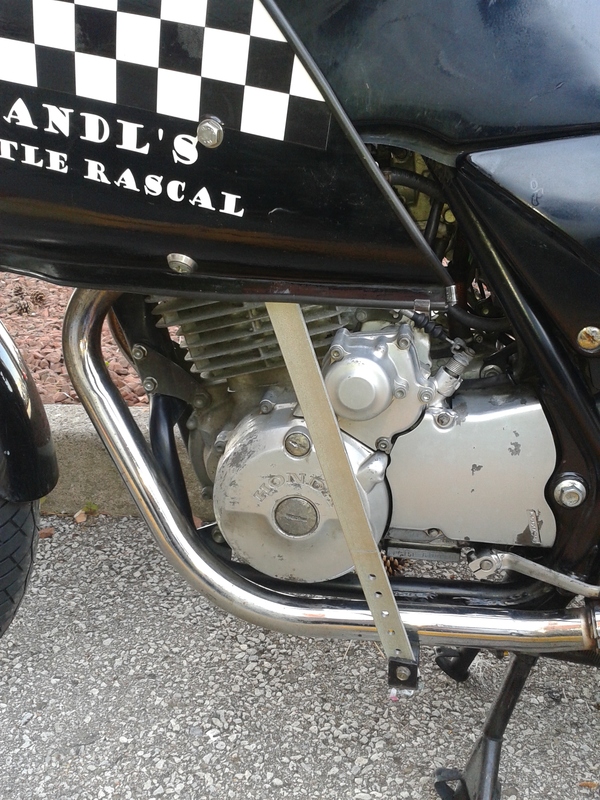 I passed by Heinz and I returned with some iron bars that I planned to put between the fairing and the older lower holders – something to be done in Canada. Another last-minute task. At home, I had to start to pack my things – very late! But in the end, everything was ready: divided into the luggage for the rally and for the vacation. MJ and I will pass a couple of days in Canada, touring around with a rental car. I was explained that the inspector had to go to the warehouse and to check the bike first. After an hour, the official explained the paper documents and told me that he had helped me because he had convinced his boss to give me the paper already now and not in one or two days (!!!). Incredible. 50$ customs fees and I finally could leave after more than one hour. The meter in the taxi seemed to be glowing due to overheating 😉 I had to pass by the hotel and grab a tool I had forgotten and finally I was back at the warehouse. The taxi fee was astronomic. 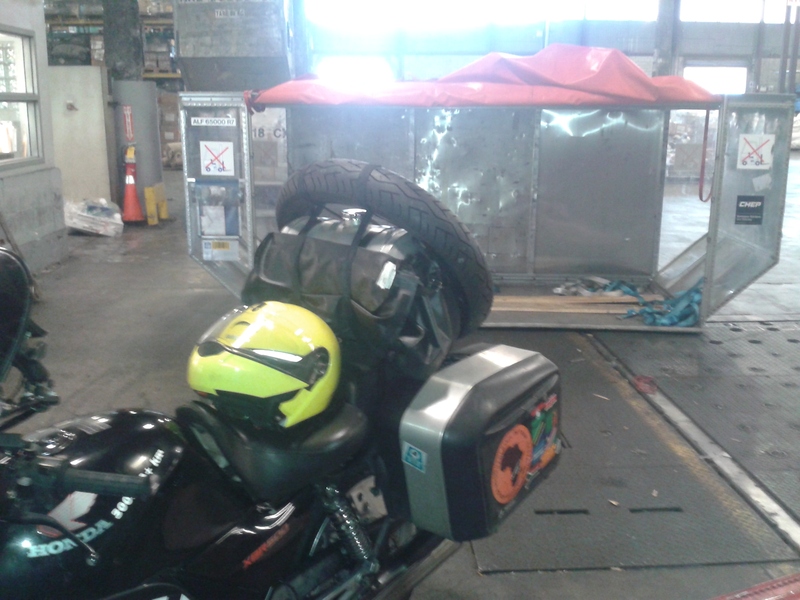 Some paperwork later and 80 $ later, they delivered the bike at the gate and I helped to untie it in the crate. OK, just connect the battery and let’s get back to the hotel. The starter turned, but the motor wouldn’t start! I tried for a couple of minutes, but no success. I felt some panic coming around the corner. What now?? Let’s try a jump start. I pushed the bike up the ramp….and realised that the kill switch was pushed a little bit. Argh! The bike started immediately. How embarrassing! Back in the hotel I made an arrangement that I could leave the bike for the next week in the parking. 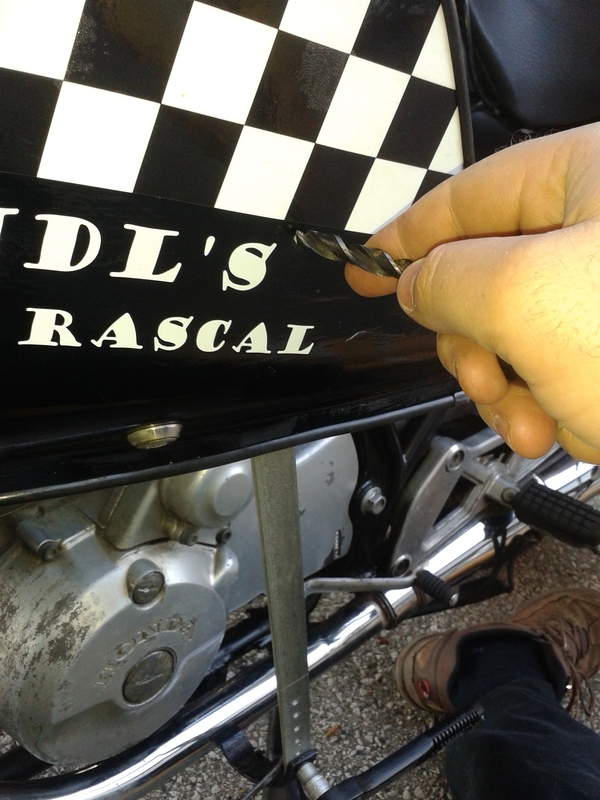 The next morning, I fixed the two prepared bars to the fairing, drilling holes in the fairing…manually! Heinz had also prepared me for that, making a hand drill. …but the result counts. Not made to win a design prize, but form follows function. After less than one hour, the work was finished and I feel relieved now, the fairing should be stable again now. I picked up the rental car and we Toronto eastwards, heading for Montreal. Straight highways with 100 km/h speed limit…my daily business during the next weeks. 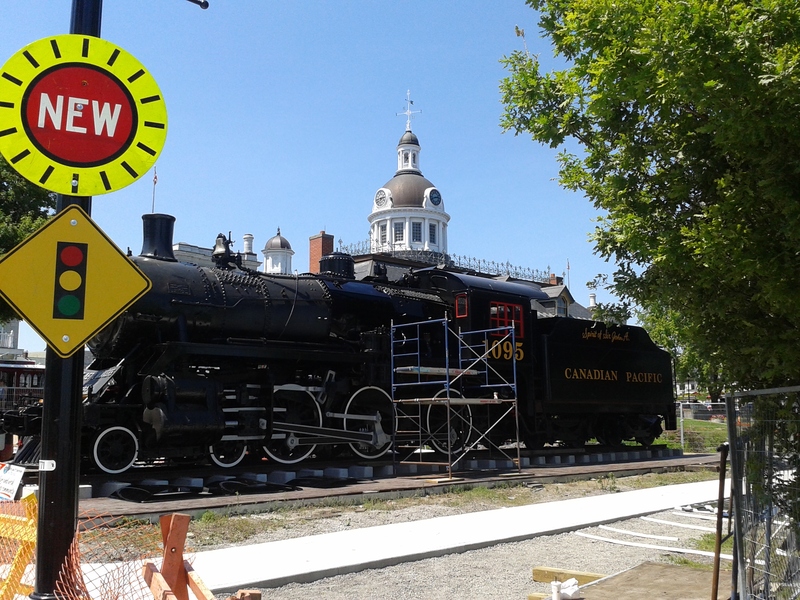 We made a quick stop in Kingston, the former capital of Canada with some historical buildings. In the evening we arrived at our hotel near Montreal and talking to the concierge at the reception I realised that Québecois is different from the French spoken in France. A totally different accent. At the dinner, I was so jet-lagged that I hardly could keep my eyes open. 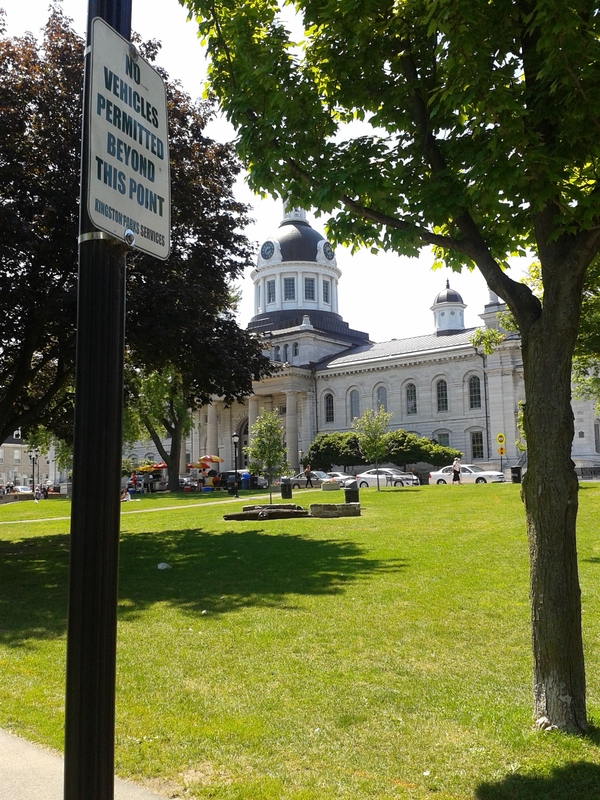 At first sight, this looks very much European than in the Ontario province. Next task: visit Montreal. ← A biker’s work is never done…but amputation??? So wie Du es jetzt hast, geht das Gewicht der Verkleidung, praktisch auf eine balancierende einzelne Strebe und die wird sich höchstwahrscheinlich unter der Bewegung drehen. Zeit hätte ich vielleicht, aber ich denke, das sollte schon reichen. Ist ordentlich fest und die Kraft kommt eh von schräg oben (Resultierende aus Schwerkraft und Winddruck). Mehr Stabilität hatte das vorher auch nicht, im Gegenteil, da war es fast 2kg schwerer. Ich weiß, daß ich nerve. So wie Deine Stütze steht, stützt Du nahezu nur Kräfte von oben ab. Die Kräfte von vorne werden jetzt ausschließlich von der eigentlich nicht ganz so stabilen Bügelbefestigung am Rahmen aufgenommen und der ich misstraue ich aus Erfahrung. Bezüglich der Kräfte von vorne bringt Deine Stütze so also sehr wenig bis nichts, da der lange Hebel nur nach hinten gedrückt wird. Ich weiß das, das Vorgeschlagene nicht schön aussieht, aber “form follows function” und willst Du einen “killer” oder einen “dressman”. Sorry ’bout your loss! Good that you now got it supported and secured. These aerodynamics they are… …dynamic, to say the least. Alter one thing here and get a reaction where you’d least expect it. And want it. Entering the continent via Canada, will that cause trouble or not if your route during the IBR calls for a quick in-out operation…? Or: ‘Welcome back! Didn’t fancy the US that much, did we…? Fingers crossed any which way! Not sure abot the sum since I never tried to go to US and back into Canada. Sounded a bit different from when I shipped my bike to Toronto. Yes the warehouse and the customs where on opposite side of the airport, yes it was a long cab ride back and forth. BUT since I had to bring out my GPS to have the cabbie find the way to the customs he waited for me for free…. and the customs stuff took like 10 minutes. Didn’t have to go back to the warehouse and check the bike and didn’t interrogate me at all. Hope you don’t need to export the bike from Canada and import it into US. From what I have read it will not be needed but then again nothing is the same between US and Canada since 9/11. Best of luck in the rally and have a great time.